What do you get with the Digital Ad Package? The key to any successful business venture is attracting customers; on the internet we call this “generating traffic.” In other words, you want to attract as many people to your website as possible, the more people, the more business, it’s that simple. There are many methods and strategies to accomplish this goal. The tools in our marketing kit have been developed by advertising experts who have created global advertising campaigns generating millions of dollars in sales. Each component of your package is customized with your personal domain name and business contact information. 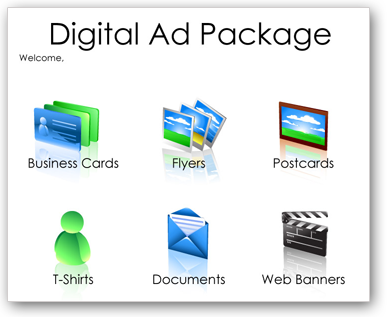 Below is a just a sample of some of the proven advertising tools included in your Digital Ad Package. A collection of static and animated internet banner ads to use on third party websites and banner link exchange programs. A variety of full color postcard templates for you to print and mail to your prospective customers. We have created handful of tested sample ads that you can place in newspapers, magazines, and even interenet classified sites. This information will help you streamline your internet business and help you avoid common mistakes. This is a great resource for internet marketing information. Custom business card designs for your immediate use. Just choose the design you like and print them from your home printer, or have them printed professionally at your local office supply store. Ready to use flyers, perfect to use as mailers (e-mail or post) or to hand out personally. We are confident that this collection of highly effective internet marketing tools will assist you in bringing rapid growth and financial success to your online business venture.